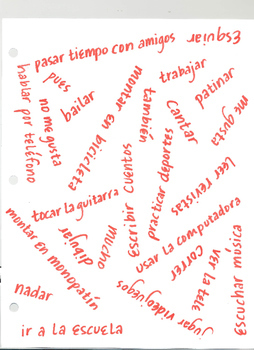 This is a PDF of a game board (size of a standard piece of printer paper) that you can use to help your students review the vocabulary from Realidades 1, Chapter 1A (leisure time activities). I call it the Crossout Game, and my students love it! You'll need to make half as many copies as there are students (they play in pairs). It features all of the vocabulary written in a "jumble" such that the words are all scrambled together into a crazy cloud of words. Put the students in pairs and have them each take out a differently colored highlighter or brightly colored pen. The game is beautiful in its simplicity - you simply call out the vocab words in English, and the first student to find the corresponding Spanish word on their game board and highlight/circle it gets the point. I usually call out between 20-30 words, and whomever has gotten the most at the end has won the game. (You might want to stop about halfway through and let them do a score check so they know where they stand.) If there is still a tie, you can always just give a tiebreaker to that pair only. The only rules are that the game board must be placed equidistant between the two players, and neither player can move it, pull it away in an attempt to sabotage, or touch the other player in any way. It really is a very fun game, and a quick and easy way to review the vocab for 10-15 minutes.